1. The congregation must average 50 people in weekly worship for 12 months. 2. The congregation must include adults from ten or more resident families. 3. The congregation is willing to carry out the expectations of other full-member churches in the national conference. 4. The congregation shows evidence of financial self-sufficiency and an ability and willingness to pay assessments. 5. The congregation notifies the Executive Leadership Team, in writing, of its desire to organize as a church. 6. The church submits to the bishop a copy of the National Conference Covenant signed and dated by the chairman of the local board and by the senior pastor (or a leading layperson, should the senior pastor be chairman of the local board). 7. The Executive Leadership Team votes to receive the congregation into full membership. The Church of the United Brethren in Christ, USA, invites existing congregations to be adopted into our fellowship. These steps should be followed when an existing congregation which is not affiliated with the United Brethren church wants to be adopted by the national conference as a United Brethren congregation. 1. The congregation will notify the Executive Leadership Team, in writing, of its desire to affiliate with the national conference. a. The doctrinal teachings of the church. b. The church’s willingness to abide by the Confession of Faith, Core Values, and Discipline of the Church of the United Brethren in Christ, USA. c. The church’s willingness to meet the expectations of all other full-member churches in the national conference. d. The willingness of the church’s members or constituents to individually become members of the United Brethren church, according to the procedures specified in the Discipline. e. Evidence of financial self-sufficiency and an ability and willingness to pay the partnership fee. 3. The Pastoral Ministry Leadership Team will meet with the senior pastor to review issues of ministerial credentialing. 4. The US bishop or his appointee shall facilitate any other meetings designed to facilitate mutual understanding and familiarization. 5. A majority of the church’s constituents or members must vote in favor of being adopted as a United Brethren congregation. 6. 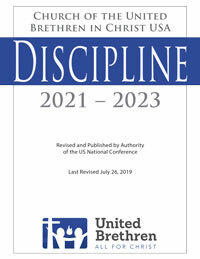 At least ten resident member families have been received individually as members of the Church of the United Brethren in Christ, USA, according to the procedures and requirements specified in the Discipline. 7. The church submits to the bishop a copy of the National Conference Covenant signed and dated by the chairman of the local board and by the senior pastor (or a leading layperson, should the senior pastor be chairman of the local board). 9. The Executive Leadership Team designates the church as a full-member congregation of the Church of the United Brethren in Christ, USA.